Are you a life science marketing professional working to meet researchers in Boston? Biotechnology Calendar, Inc.’s Boston BioResearch Product Faire™ Event is the perfect opportunity to market your life science solutions to an engaged, receptive audience of professors, post-docs, purchasing agents and lab managers. Our Boston BioResearch Product Faire™ event will be held on April 24th, 2014. With twenty years of experience organizing life science events, Biotechnology Calendar, Inc. can assure lab suppliers that their company will benefit from exhibiting at our events. Biotechnology Calendar, Inc. life science events provide a space and time for you as a lab supplier to educate your customers about your latest and best products and services. Participating in our events allows you to increase your exposure and credibility within a market of well-funded researchers. Our event programming and pre-show advertising will increase your company’s name recognition at Longwood Medical, and by meeting face-to-face with researchers, you can gain your customers’ trust as a company that’s interested in their research needs. Our strategic marketing opportunities are designed to increase awareness of your brand, allow you to meet new strategic contacts and make you stand out from the competition. We can build a specialized program for your marketing needs at Longwood Medical, whether you’re interested in custom advertising packages, online marketing, sponsorship opportunities or a competitive edge in event programming. Biotechnology Calendar, Inc. also provides special opportunities to increase your brand awareness easily and economically. Lab suppliers interested in life science marketing in Boston won't want to miss out on meeting researchers at our Longwood Medical life science event. Harvard University is a well-funded institution, according to NIH and NSF funding statistics. In 2012, the NIH awarded Harvard University $392 million in life science funding. A full list of departments receiving NIH funding can be found at the NIH website. In addition to receiving funding from the NIH, Harvard University also received $55.3 million from the NSF in 2012. Harvard University had a total operating budget of $655 million in 2011, with research grants and contracts contributing $304 million. For more funding statistics on Harvard University, please read our blog article Harvard Medical Life Sciences Update on NIH Funding and Research. Given these funding statistics and Biotechnology Calendar, Inc.'s marketing opportunities at Longwood Medical, it’s clear there is a lot of sales potential for lab suppliers engaging in life science marketing and working to meet researchers in Boston. 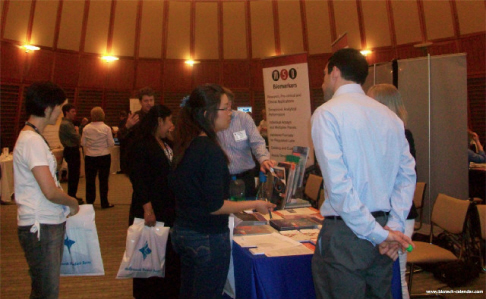 Biotechnology Calendar, Inc. invites lab suppliers to network with researchers, lab managers and purchasing agents at our Boston BioResearch Product Faire™ Event on April 24th, 2014. Biotechnology Calendar, Inc. is a full-service life science marketing and events-planning company that organizes life science events at top research universities across the country. If you’d like to learn about life science events closer to home, we encourage you to view our 2014 calendar of events.